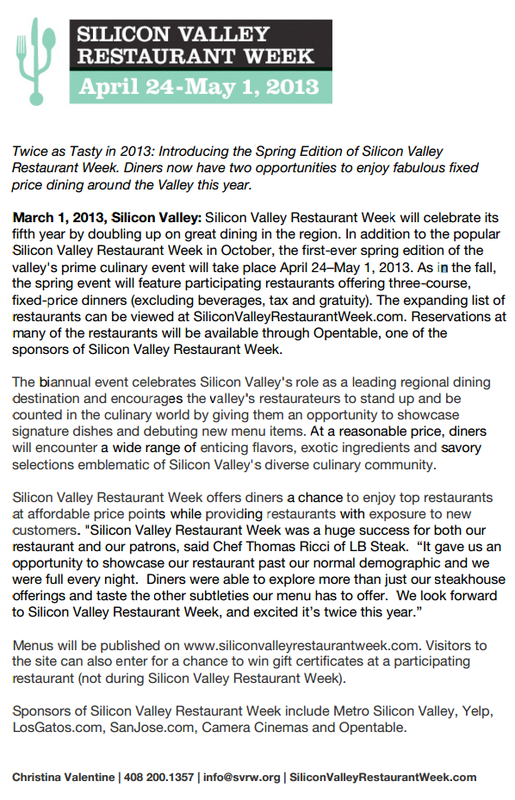 This is now Silicon Valley Restaurant Week's fifth year. Due to the success of the program, they have decided to expand the event to happen twice each year instead of only in October. Dozens of restaurants will be offering fixed-price three-course dinners, making it easy and less expensive to try out several items at new restaurants. I also have to mention that the Capital Club in Downtown San Jose is participating, which is a members-only club with a pretty slick bar and dining room on the 17th floor of the Knight Ridder building. To see the full list of participating restaurants and learn more about Silicon Valley Restaurant Week, just head over to their website over here.